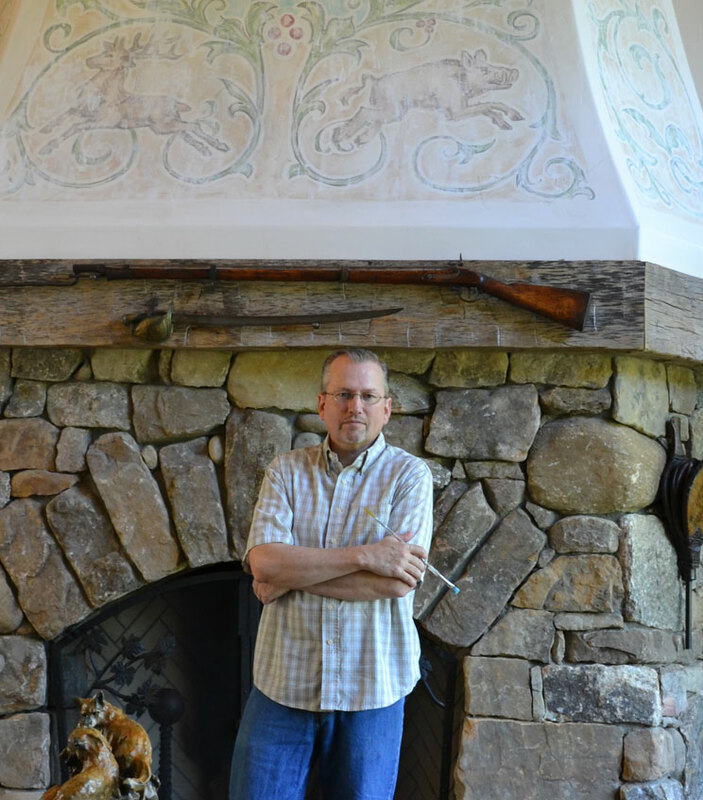 Asheville artist Brennen McElhaney takes on the challenge of painting a soaring fireplace mural. Most of my painting is done on canvas, maybe 16 x 20 inches on average. 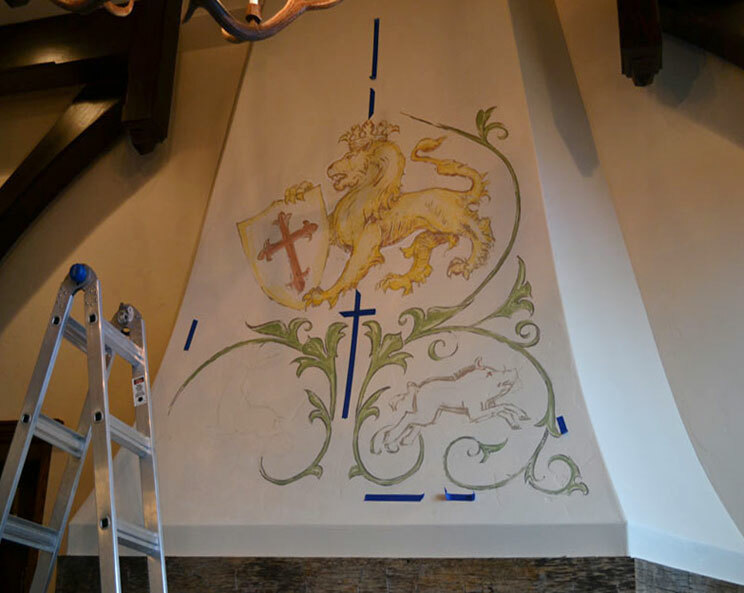 So, when my client asked if I would consider painting a 14 foot tall fireplace mural, I had to expand my repertoire a bit. 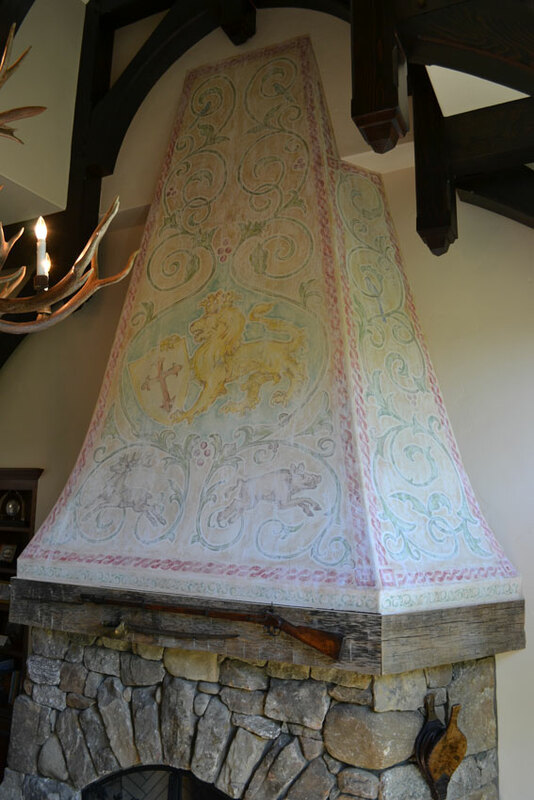 Thanks to the digital magic of Photoshop I was able to do preliminary sketches and then superimpose them onto photographs of the fireplace. This was essential to get preliminary approval from my client and to make sure that I was starting off on the right foot. Pictured below are my first and second sketches. 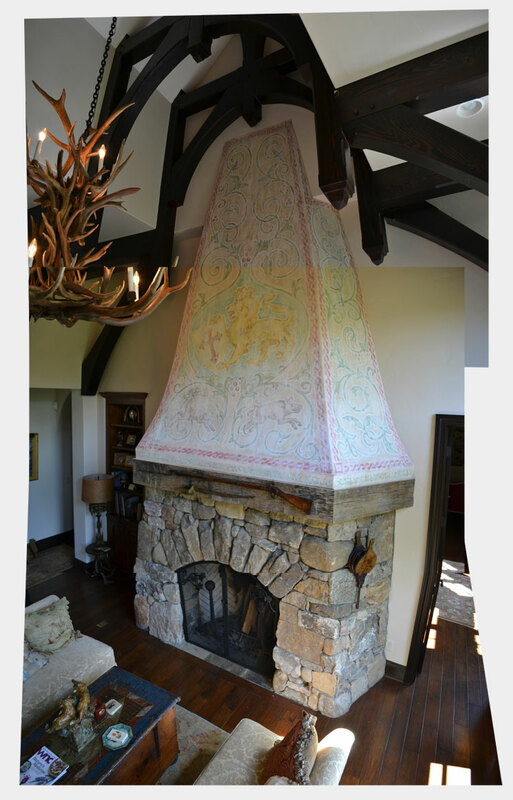 Right below those images are the same sketches photo-shopped onto a picture of the fireplace in order help the client visualize what the final mural might look like. 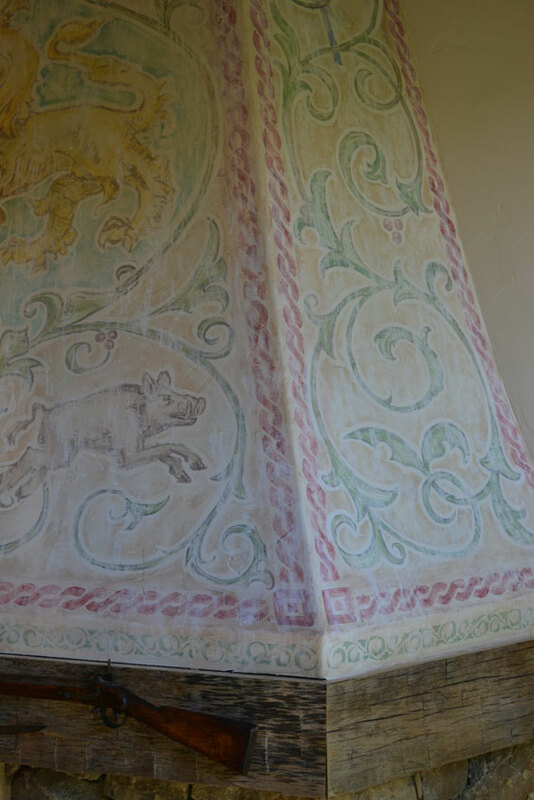 Photographs that provided inspiration for the color palette of the mural. 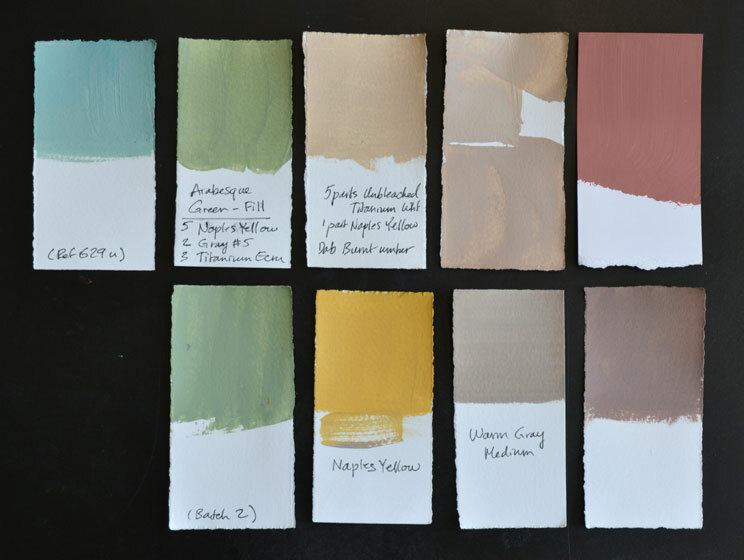 Paint samples from the mural for color reference. 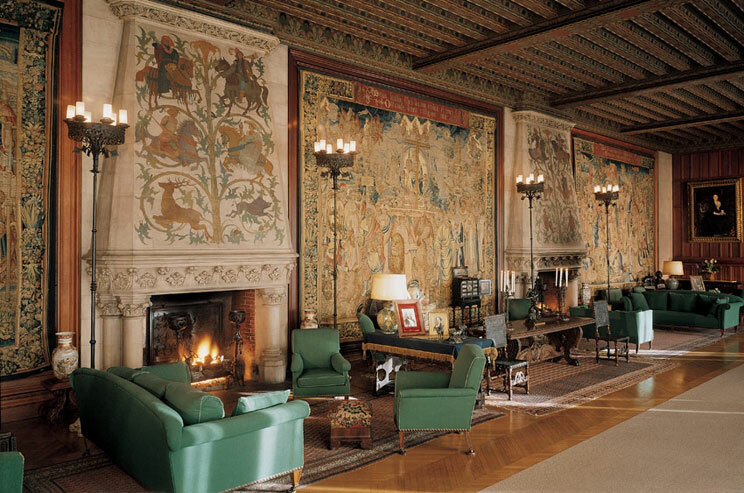 The Tapestry Gallery at the Biltmore House provided stylistic inspiration. Fortunately for me, my client had a very clear picture in mind for what she wanted. 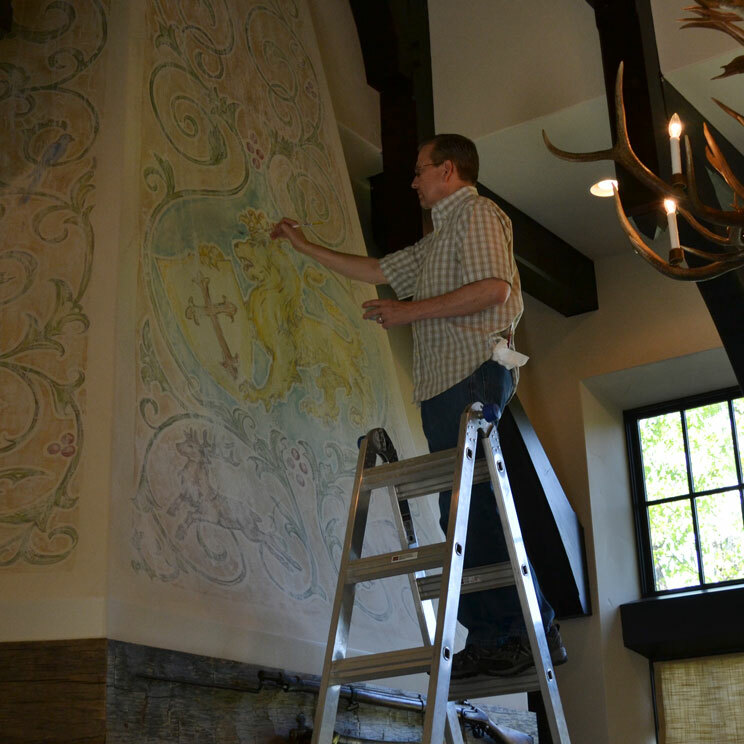 The custom-built house, which is elegantly appointed with old world style furniture, constructed with meticulous attention to detail and premium quality materials, set the tone for the mural. 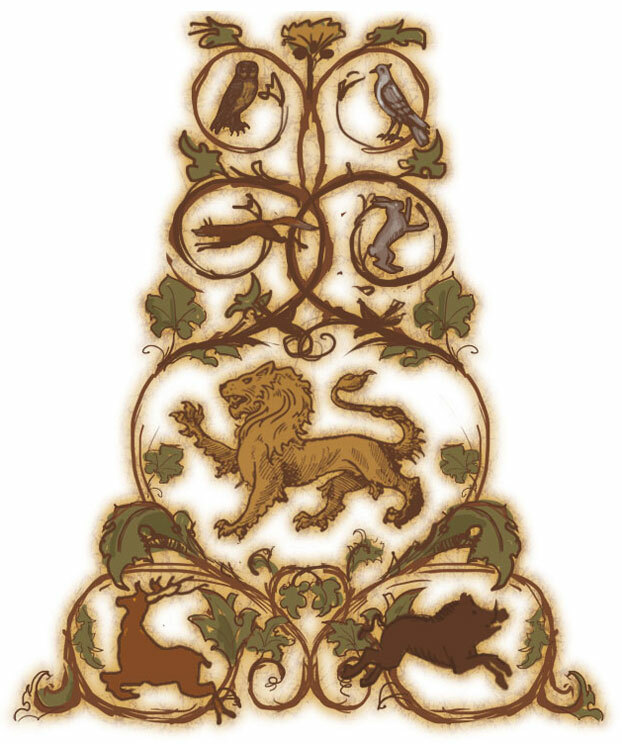 The mural itself was to feature Aslan the Lion, from the Chronicles of Narnia with ornamental filigree and heraldic animals, specifically a stag and a boar, interspersed throughout the arabesques. 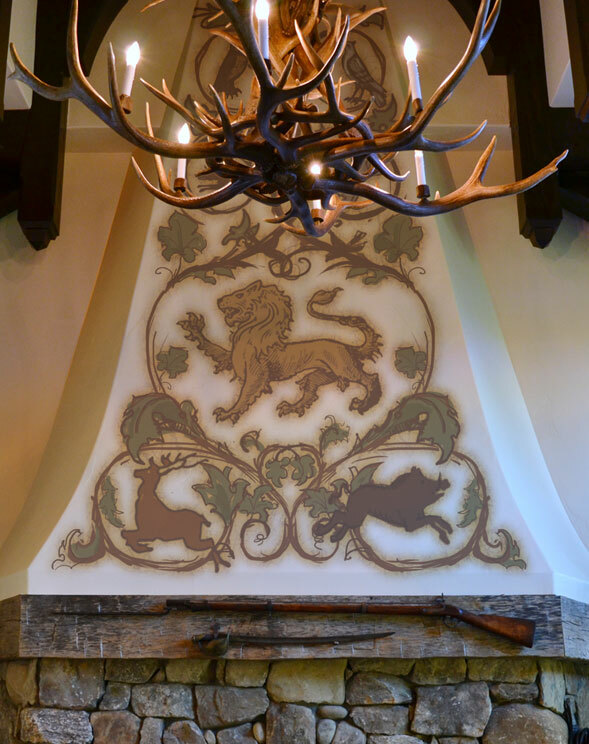 Inspired by two murals at the Biltmore House, both depicting medieval hunting scenes over fireplaces in the Tapestry Gallery. I have to admit this was a daunting task. The great room has soaring ceilings (25 ft. at the highest point, by my estimation). 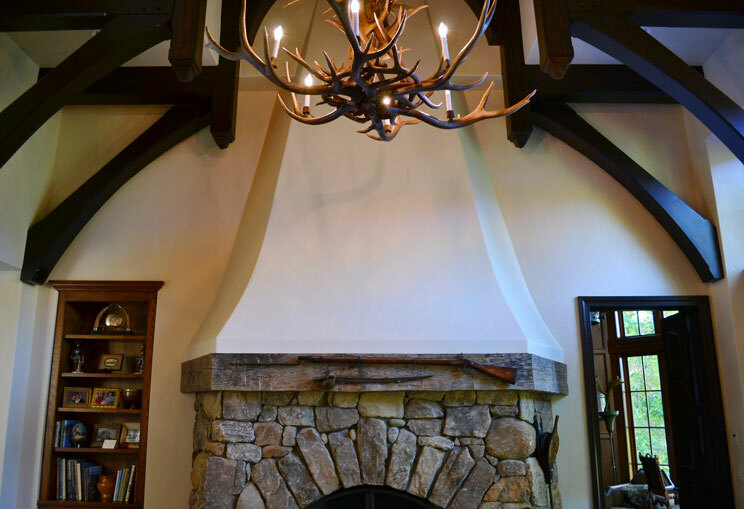 The fireplace with cut stones and field stones rising to about 6.5 feet. 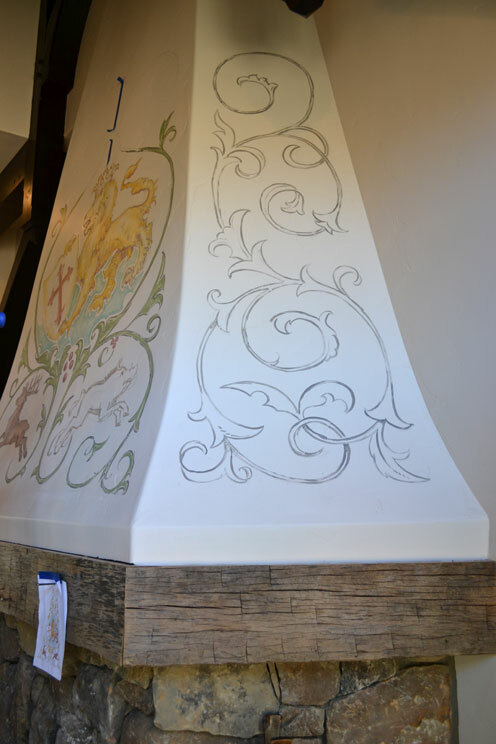 The main surface of the hood is a wedge shape about 7 feet wide at the base, tapering upward 14 feet to about 3 feet wide at the top. 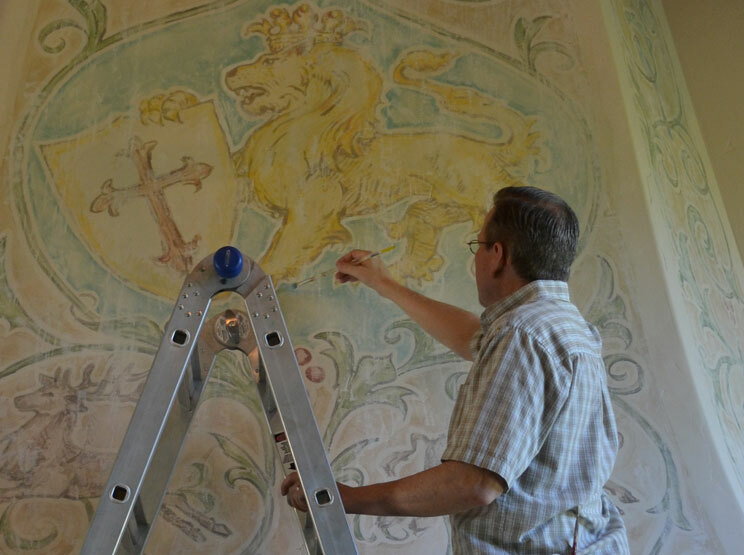 Beginning the painting. The blue masking tape provided useful reference for symmetry. 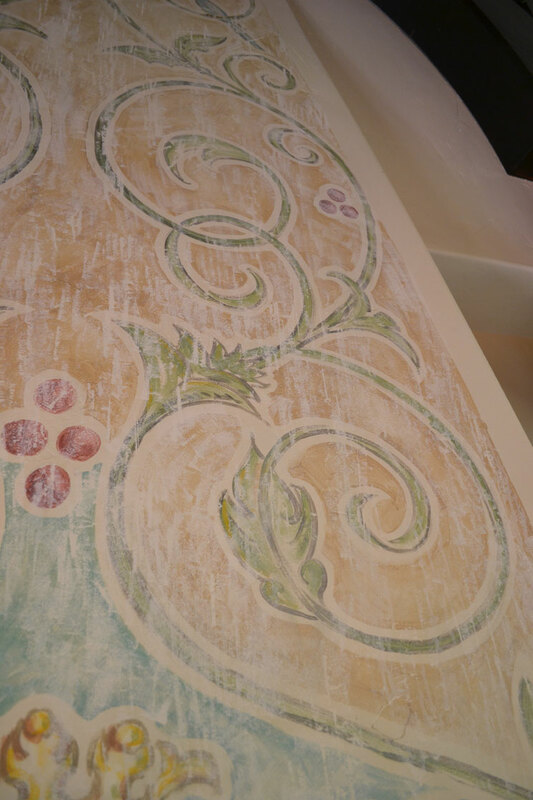 It is tricky to draw a large symmetrical design. 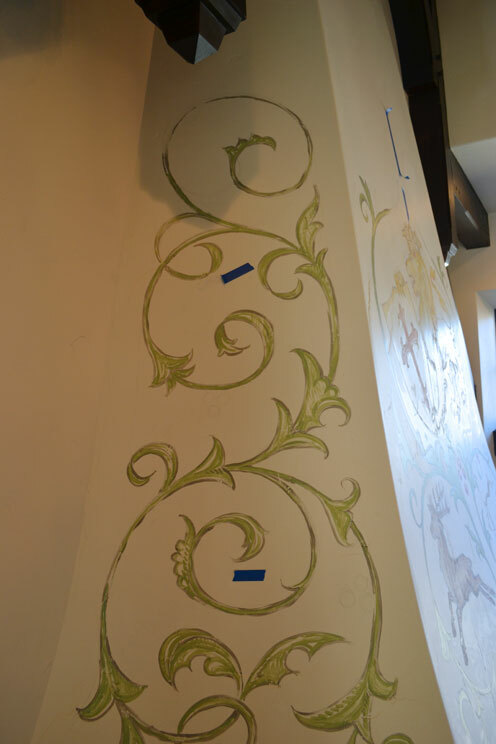 In order to accomplish this I outlined the arabesque motifs on large sheets of tracing paper. 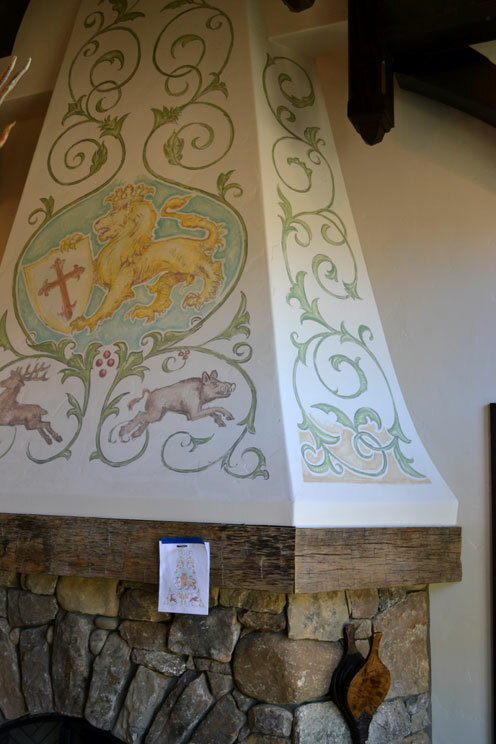 Then I took the line drawings, flipped them over and positioned them to mirror the design on the other side, and then drew over the line, transferring a light pencil impression onto the wall. Working on a ladder 20 feet above the floor was a challenge, to say the least. I could only work for an hour or a two at a time. Detail showing distressed texture treatment. 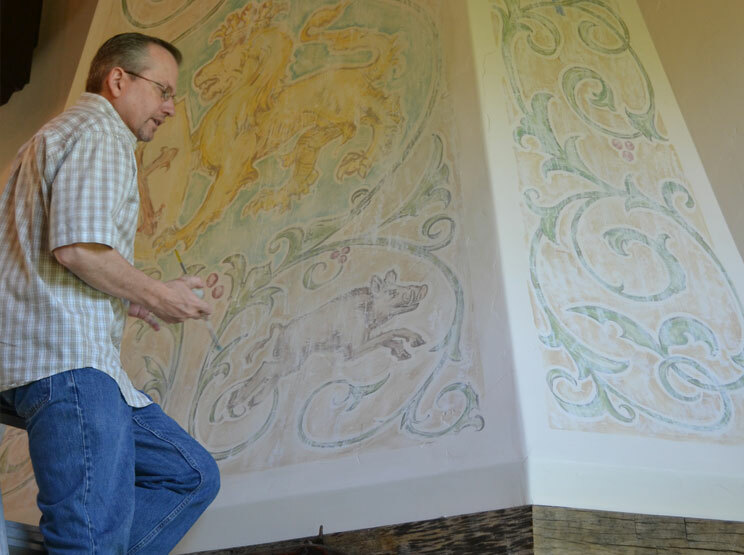 The final step was to create a distressed texture over the entire mural to give the look and feel of age and history. This was achieved by two methods, one additive and the other subtractive. 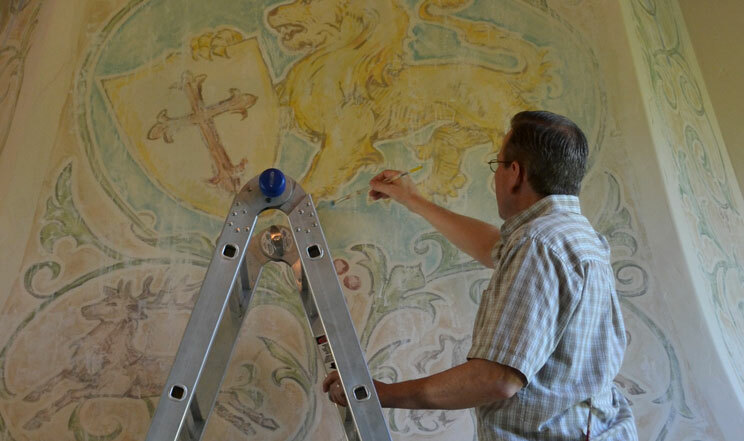 I scrubbed the paint of with an abrasive sponge to remove some of the paint of the mural. 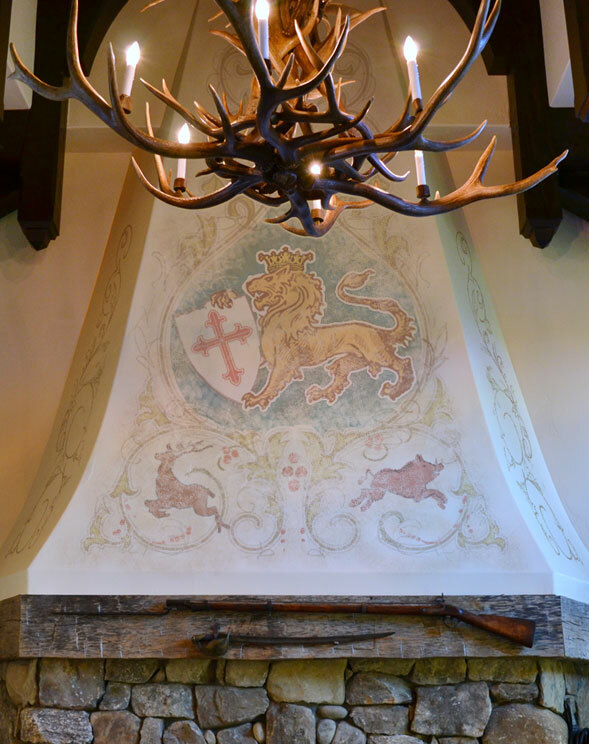 Also, added texture by painting irregularly over the fireplace mural with the same color as the wall. 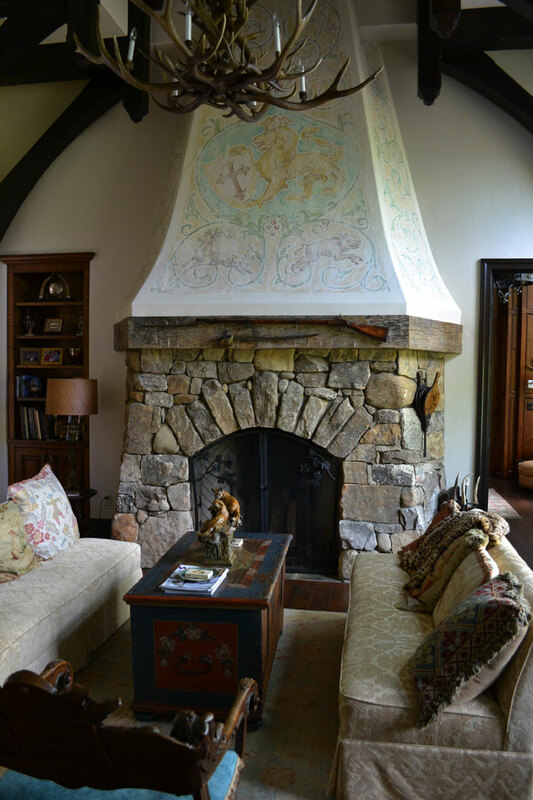 Three photos joined together to show the grand scale of the fireplace and mural. 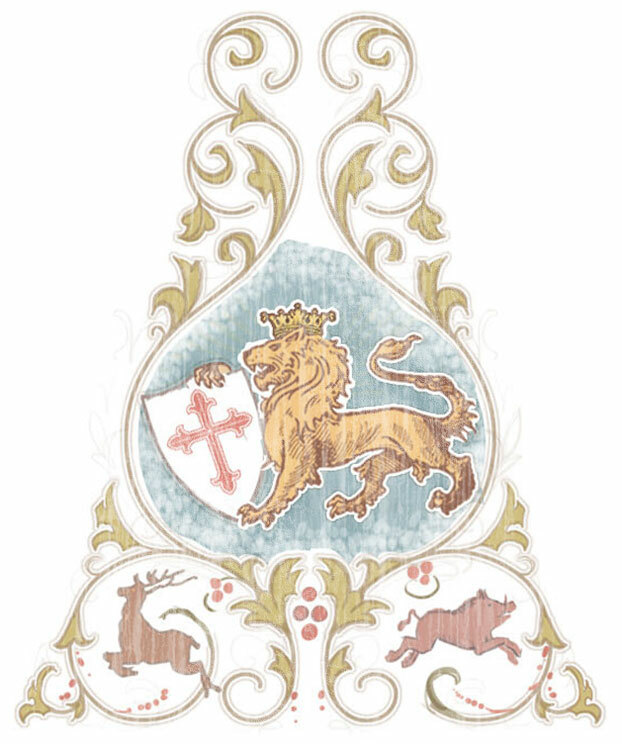 As a finishing touch, a red decorative border was added to enhance the magical “storybook” quality. Brennen, what an amazing project! I love how it turned out. The whole thing has such a beautiful storybook quality. What a treasure for that family. Oh, Brennen, this is elegant and breathtaking. I also enjoy all your behind-the-scenes commentary. Fantastic, Brennen! Hope you took a nice holiday after all your hard work. Congrats on yet another beautiful job. 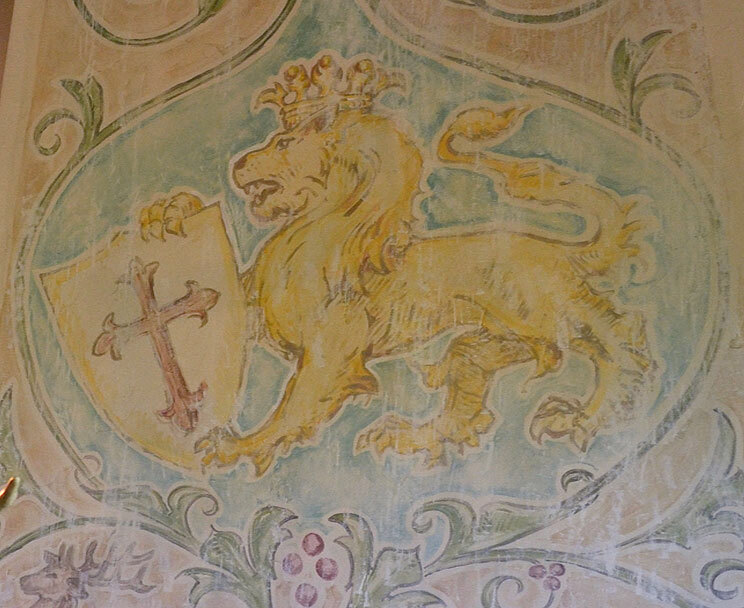 Brennen, looks like it has be there since the middle ages. Wonderful! Wonderful! Wonderful!